A Spanish priest who pleaded guilty to aiding gang members in El Salvador was sentenced Thursday to 2 1/2 years in prison, but will not have to spend any time behind bars, a Salvadoran judicial spokesperson told Efe. "As the sentence is less than three years, it was changed to substitute measures," the spokesman said. The Rev. Antonio Rodriguez, a parish priest in Mejicanos, near San Salvador, was arrested July 29 on charges that he smuggled banned items to jailed gang members. Attorney General Luis Martinez said last weekend that the priest had agreed to plead guilty and cooperate with authorities. Under the plea agreement, Rodriguez must stay away from prisons and have no contact with gang members, the judicial spokesman said. He is, however, free to travel abroad, the spokesman added. 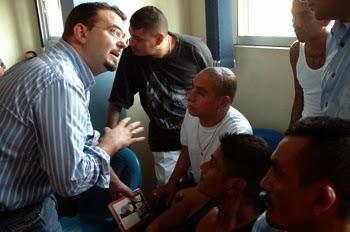 Prior to his arrest, Rodriguez - known as Father Toño - ran a rehabilitation program for former gang members. The priest faces additional charges in a separate, ongoing case, the court spokesman said. As has been explained to me by someone close to the situation, it is better to suffer the consequences of this plea than suffer what might come of potentially implicating a gang member. The sad state of affairs that includes things like the power of the gangs and the corrupt legal system in El Salvador continues. As adalberto vazquez gomez would say, something is better to none in hand.